Since I have been in a state of Perpetual Sitting on the Couch Eating Cookies, I’m finding it very hard to change my speed (faster than sitting pace) and direction (towards anywhere other than the couch). I blame physics. But I also love the amazing wonderfulness of my warm, cozy bed on cold, dark mornings. I swear, every morning it somehow feels better than ever before. I better cherish this moment, this best ever comfy-ness. I’m never leaving. And obviously oatmeal cookies beat all other varieties of oatmeal. (But, if we're taking cookies, try these, which I just made this week and are not even remotely, possibly good for you, but completely delicious. *) Despite loving training, I can’t quite get out of my off-season state. So yeah, inertia. It’s real. An object in motion will stay in motion (left). An object not in motion will bake cookies (right). I’m trying to nudge myself in the right direction. Get a little momentum. Inertia can be changed by the application of external force. (Like this video designed to get bodies off couches and excited for Grandma’s Marathon.) It’s early yet; official marathon training won’t start for a few more weeks, but the first race on my schedule will be here before I know it. But it’s hard. I said last week that I like marathon training because it rises in a slow crescendo to the peak race. You climb the mountain of training, then—when you finally make it to the top—you jump for joy, plant your little flag, scream “I did it! I did it!” But then you quickly slide down the other side. You get to the bottom—full of cookies and beer and ensconced in warm, cozy sheets—and look up ahead. Another mountain to climb. Didn’t I just climb that mountain? Why am I back at the bottom? That slide back down is important: your body—and mind—needs rest. Without a proper break you risk burnout and injury. Still, it’s hard to look up at that mountain and see how far you’ve got to go. A couple weeks ago, I went for a “long” run with the GRC girls. I hadn’t been with them in a while, but everyone insisted we’d go slow. 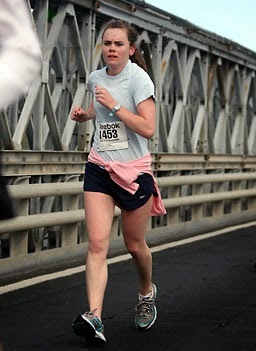 I didn’t wear a watch, so I have no idea our actual pace, but their “slow” felt like sprinting and I fell way back. (Full disclosure: I may have had too many indulgences at our team party the night before. But also—let’s be honest—I’m out of shape.) The next week I decided it might be nice to get some semblance of speed, so I did a 5 minutes on, 5 minutes off fartlek. Woof. Five minutes is an insufferably long time when you’re out of shape. The force required to push an immobile object up a mountain is immense. The good news is it's easier to climb the mountain when you've been there before and know your way. The bad news is you can’t climb the mountain from the couch or your warm, cozy bed. *Or try these super easy mini-brownies for the Super Bowl! Alright folks. 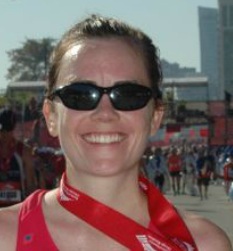 I've blabbed enough about my last marathon. Time to move on... to blabbing about the next one. There’s no real reason to do another marathon before the Trials. 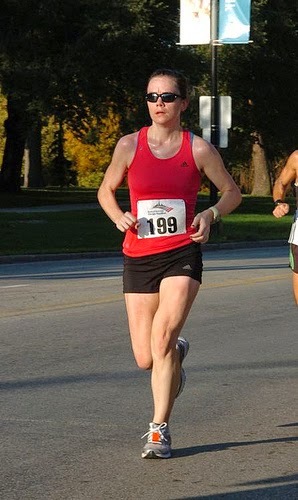 With the qualifier in my pocket, I could take this season “off” and focus on speed (or “speed” to a marathoner, meaning 10Ks, 10 milers, and half-marathons). So I don’t need to run a marathon in 2015. But I want to. Of course, there may be benefits to not running one. (Like actually having some speed/not having to use quotes when I type that word.) But I tried that once. 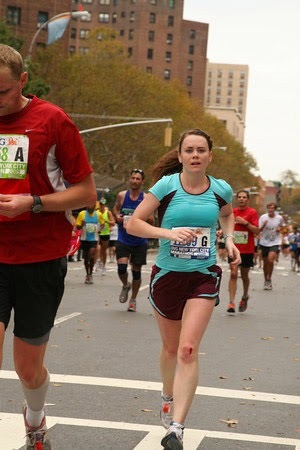 Maybe it made me a better runner in the end, but it wasn’t as much fun. 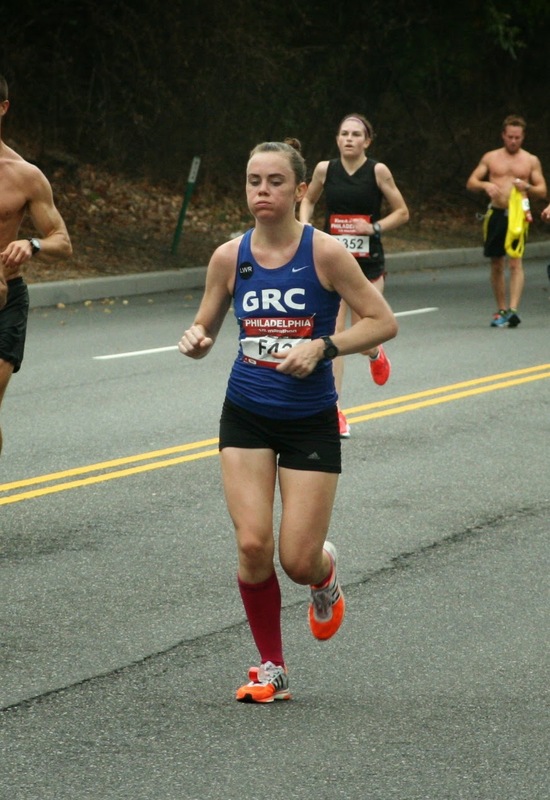 During my first season with GRC I stepped down in distance and ran races from the half marathon to 6K cross country. I struggled, maybe with the newness of the team (doubtful, I loved them), maybe with iron deficiency (likely), maybe because I just couldn’t get in the groove of that kind of training (possibly). I like having one peak race at the end of the season, and other races and efforts rising in a slow crescendo, building on each other to the ultimate culmination, the hardest and longest effort: the marathon. Besides, I’m not doing this out of obligation or to make millions (unless you'd like to give me millions? ), I’m doing it for fun. 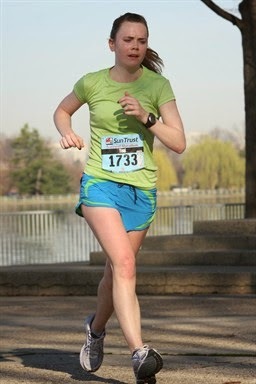 And fun for me is 26.2 miles of glorious pain. 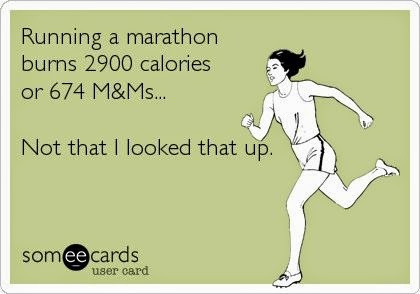 Mathematical Fact: It's fewer M&Ms in shorter races. 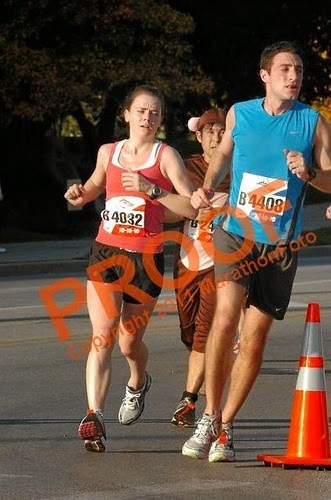 In a recent post on Zelle, Dane Rauschenberg lists 52 reasons to run a marathon. His first reason: “While you can get an amazing high from tackling any race distance, conquering the mother of all races gives you a high which is hard to duplicate.” The amazing effort and triumph of the last one, the drug-like euphoria that came with it, the celebrations, the ice cream sundaes—it just makes me want to earn that again. 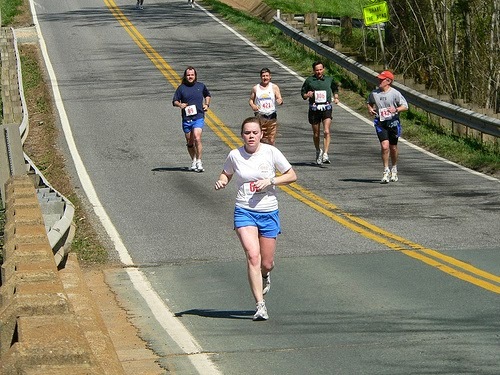 26.2 miles, one of the most addictive drugs out there. One of my teammates put together a post on what I had done last season (compared to previous seasons) to get the qualifying standard. (His conclusion? Not much.) In his analysis, he surmised—correctly—that I sacrifice time and performance at other distances for success in the marathon. 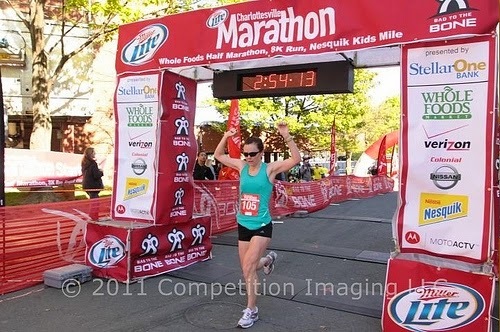 It’s true, my PRs for ten miles and the half marathon don’t stack up to my marathon time. (And don’t get me started on 5Ks.) And that doesn't really bother me. 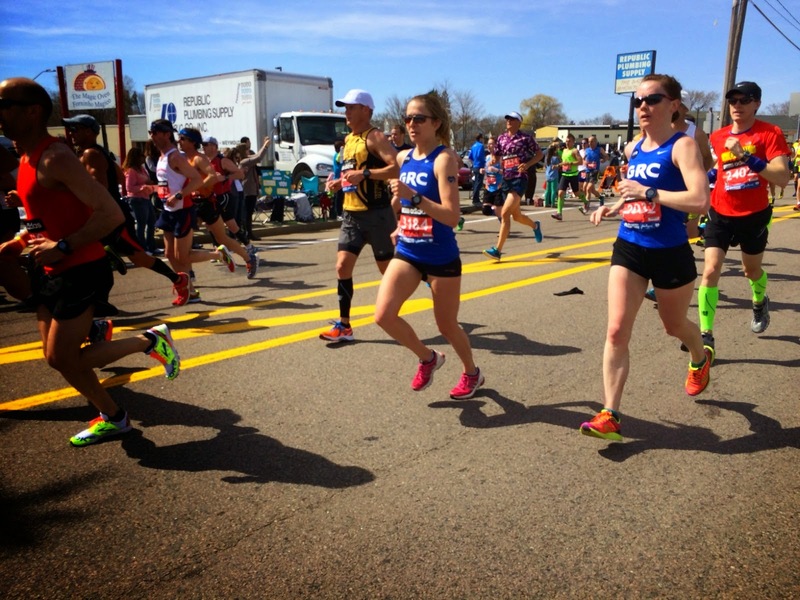 I’ve said it before on this blog: all I really care about is the marathon. I’ll be cautious this year; the most important thing will be to not get hurt before next February. But barring major disasters, the second goal will be—as always—to get faster. I’ve got a bit of extra confidence in my training after last season’s successes, so I’ll take it much the same way: roughly a race once a month, building to the marathon. Will I be able to catch the same fire I did last season? Will I be able to beat Brother in the City of Brotherly Love Family Duels RunnerTeal Fails? Will I earn a post-marathon ice cream sundae that's as hugely delicious? I don’t know. But I’m going to try. 10,000 Frustrations: The number of discouraging, awful, terrible days/moments/workouts/races/thoughts a person must experience before reaching their goal. 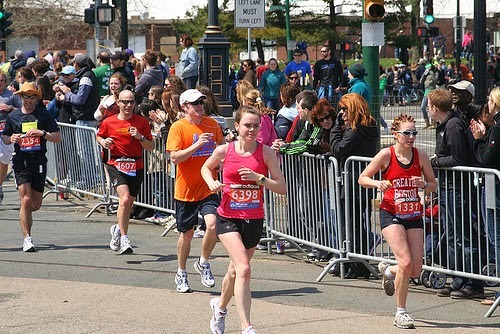 I’ve posted around twenty race reports since starting this blog and about half of them are discouraging: every race in Philly, most 5Ks (this summer I ran one at the same pace I needed to run 26.2 miles), the previous two marathons. Maybe that’s not quite 10,000, but I overuse the heck out of the word "frustrate" and an awful lot of those uses don’t even make it to the blog. Last week I mentioned the best workouts of each season, but not the worst: the marathon pace workout that got cut short and became a slow and pathetic shuffle home; the tempo run(s) where I needed to keep stopping for breaks and still couldn’t hit the prescribed pace; the many other workouts and races that were wildly off my goals, making my big dreams seem both ridiculous and impossible. I had the best season of my life last fall, but I was close to rock bottom in September. 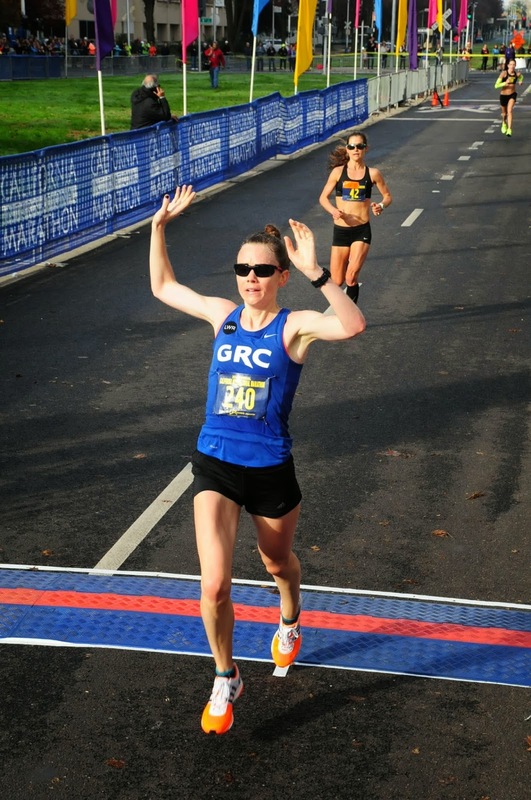 After an embarrassing race capped off a terrible month, I jotted down some discouraging thoughts: When was the last time I had a good race? 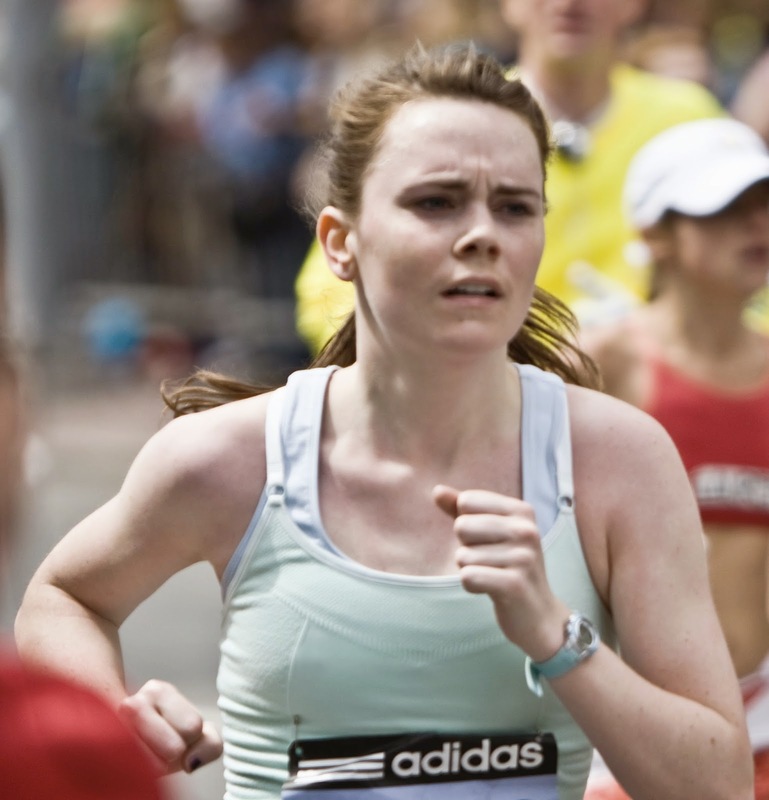 I keep making excuses… Maybe I'm just not as fast as I think I am. That thought/realization/fear was like a punch in the gut. 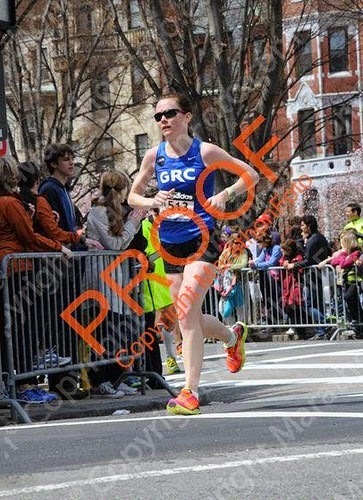 It had been months since Boston, when that phrase had started its endless loop in my head. Nothing since had silenced it. What was the solution? How did I move past what seemed like the 9,999th discouraging moment? Two ways: I was ever so slightly flexible and also unflinchingly stubborn. A week and a half after Philly, I had a tempo run on the schedule. I’m awful at tempo runs; my expectations and actual paces are always vastly mismatched. (Or is it my expectations and actual abilities that are vastly mismatched? That was the interminable question.) I always did them on the same stretch of road, out and back. Like the old cliché, it was uphill both ways. (It’s actually pretty flat, but the effort felt that way. And—I swear to you—the wind was assuredly in my face both directions.) I’ve used this same route for years and tempo runs have never gone well. So I stopped doing the same thing and expecting different results. I changed it up. I found a new route (a loop that I would have to circle a couple times, but no matter) and it made all the difference. I actually hit my goal pace for the first time in years, if not ever. Did new twist on old route this morning & had great run. "I took the [running route] less traveled by and that has made all the difference." Maybe sometimes what we need is a fresh take. I have too many memories of tempos gone poorly on that route; maybe it was getting in my head that it was uphill and windy both ways. I think it’s possible that part of the reason I fell apart in Boston this year—at the exact same place as last year—was the memories and doubts from the year before. As soon as you let a doubt sneak in—“I’ve been here before, and it hasn’t ended well”—it’s all over. Sometimes you need to change things up: training routes, workout structures, race courses or distances. Give your brain a chance to not know the end result before it happens. What happened next? Loyal readers know the story: I took that one workout (the Only Successful Tempo Ever) and I ran with it, literally. I used it to fuel the remaining workouts before the Army Ten Miler, and they went well, too. I based every morsel of hope I had for Army Ten Miler on that workout—not on the many failures of August and September. And it worked. People often talk about how they get a lot of motivation from wanting to prove their doubters wrong. But I’m incredibly lucky to have a relentlessly supportive family, team, and set of friends, and often the only person who says I can’t do something is me. So when I get frustrated or discouraged, I also get a little mad at that girl that thinks she can’t. When she gets her way, I get a little more stubborn. Next time, I’ll really show her. If you look carefully at last week’s rundown, you'll see that my expectations (my A and B goals) often got faster and faster, even when I didn’t get the results I wanted the previous go-round. (Despite never breaking 3:10 or 3:05, I went for sub-3. Despite never breaking 2:50 or 2:46, I went for sub-2:43.) Is this dumb? Maybe. It could lead to more disappointment and frustration. But I think it’s actually evident of a completely rational belief that training pays off even when races don’t go as well as you planned. You’ll have your bad days—in workouts and races—but if you're stubborn enough to keep fighting, you will get better. Maybe it won’t be evident just yet. But if you’re working hard, your muscles, heart, and lungs are getting stronger. And if you get your brain to believe it too, you'll get there. So even if it is 10,000 hits, keep fighting.